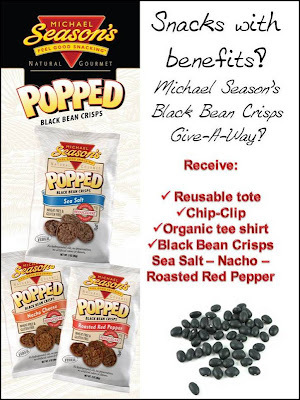 When Michael Season's contacted me seeing if I wanted to try their Popped black bean crisps, I said sure. They have three flavors including roasted red pepper, nacho cheese, and sea salt. This past weekend, I brought a bag up north with me and opened them for a little snack in the car. The crisps look a lot like mini rice cakes. I tried the roasted red pepper ones which were delicious! They are reduced fat and tasted good on their own. There is not too much seasoning powder on them which was nice. You could taste the black bean taste very well which I liked. Michael Season's also makes reduced fat thin and crispy chips. Can't wait to try these! These are gluten free which is nice for those who need gluten free. They are reduced fat and have only 4 grams of fat. These could be eaten with salsa or guacamole. They have 120 calories, 3 grams of fiber, and 4 grams of protein. The main ingredient is black beans and they are fairly low sodium (140 mg). These crisps make an excellent alternative to other fattening chips. 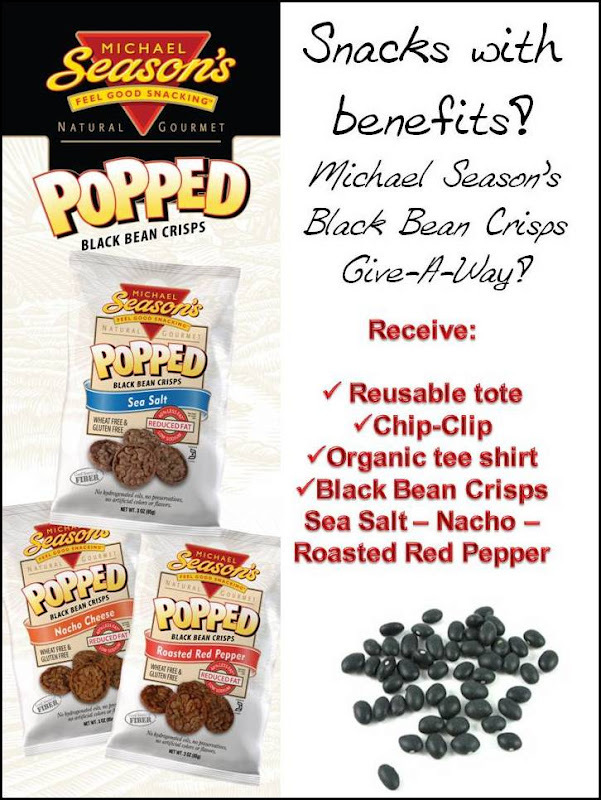 The giveaway will be for Michael Season's Popped crisps ($100 value). I WANT THOSE ROASTED RED PEPPER CRISPS!! yum! I most want to try the Baked Cheddar Cheese Puffs! I would like to try the salt and pepper chips. I would like to try the cheddar and sour cream baked potato crisps. Thank you! The Kettle Slightly salted is my 1st choice. ladyvon at grm dot net. aww the cheddar and sour cream baked potato crisps do sound like a good one to try! I want to try the Kettle Cooked Jalapeno Chips. I want to try the Nacho chips most. I'd most love to try the kettle cooked sea salt and balsamic vinegar chips! The cheddar and sour cream baked potato crisps are my pick! I would love the Michael Season's Salt and Pepper chips. the sea salt and balsamic vinegar chips sound really good to me! The Cheddar Puffs are tempting. I'd love to try the Cheddar Cheese Puffs!! They look great, would love to try them! I'd like to try the Honey Barbeque Thin and Crispy Chips. Cheddar and sour cream baked potato crisps. Omg, those look great!! Definitely wanna try the Honey Barbeque this & crispy chips. Thanks. I'd love to try the Honey Barbecue Potato Chips! I would like to try the Cheddar Cheese Puffs. The thin and crispy potato chips. I'd like to try the Lightly Salted Kettle Cooked Potato Chips ヅ *Thanks* for the giveaway! I'd like to try the Cheddar Cheese Puffs. The BBQ ones look good. I would love to try the Thin & Crispy Potato Chips Salt & Pepper. I would love so much to try the cheddar cheese puffs! I'd like to try the Honey Barbecue!! I would love to try their Honey Barbeque Thin and Crispy chips! I like to eat gluten free so this sounds good. I want to try the Popped Sea Salt Black Bean Crisps! The jalapeno kettle cooked potato chips. I'd love to try the kettle cooked sea salt and balsamic vinegar chips. yum!! I would like to try Baked Puffs & Curls. Sea Salt & Balsamic Vinegar sounds amazing! id love the thin and crispy honey bbq. Salt & Pepper Thin & Crispy. I think the Jalapeno Kettle Chips sound fantastic! Feel the burn! Yum! I'd like to try Baked Jalapeno Puffs. I would like the honey bbq chips. I want to try the Baked Puffs & Curls in Cheddar. The Honey Barbecue Kettle Cooked Potato Chips are my choice! The Cheddar and Sour Cream Baked Potato Crisps sound great to me. the Sea Salt & Balsamic Vinegar Kettle cooked chips. The Sea Salt and balsamic Vinegar Kettle Chips. My son and I both love salt and vinegar chips! The Roasted Red Pepper sounds good. Michael Season's Salt and Pepper chips. I would love to try the roasted red pepper chips. I would like to try the Salt & Pepper Thin & Crispy chips. i wanna try the salt and pepper. I want to try the salt and pepper crisps. They are thin and crispy, but have reduced fat. This sounds like the ideal snack for me. I'd like to try out the Kettle Cooked Jalapeno Chips. I would most love to try the nacho cheese black bean crisps. baked cheddar cheese puffs !! I'd love to try the Kettle Cooked Honey Barbecue! I would love to try the roasted red pepper! The kettle cooked jalapeno chips sound good. Thanks for the giveaway. Would love to try the Popped Nacho Black Bean Crisps. The salt and pepper thin and crispies sound good. I want to try the Ultimate White Cheddar Cheese Puffs the most. I would love to try the White Cheddar Cheese Puffs. Lightly Salted Thin & Crispy Potato Chips. I would like the White Cheddar Cheese Puffs.